GALLINA RIPIENA (CHICKEN STUFFED WITH BREAD, BORAGE, AND PARMESAN) « Cooking With Grandmothers Cooking with Grandmothers records, gathers, and shares the recipes, food traditions, and wisdom of female elders from around the world. Bring an extra-large stockpot of lightly salted water to a boil. Wash the borage and chard. Blanch them in the boiling water for 2 minutes. Strain and set aside to cool for a few minutes, then vigorously squeeze the greens of all their liquid (I find it easiest to do this by using a fine-mesh strainer). Roughly chop the squeezed greens. Keep the pot of water boiling. Whisk the eggs together in a large mixing bowl. Stir in the Parmesan, bread crumbs, diced onion, garlic, nutmeg, herbs, and salt. Mix well to combine. Stuff the cavity of the chicken with this filling. 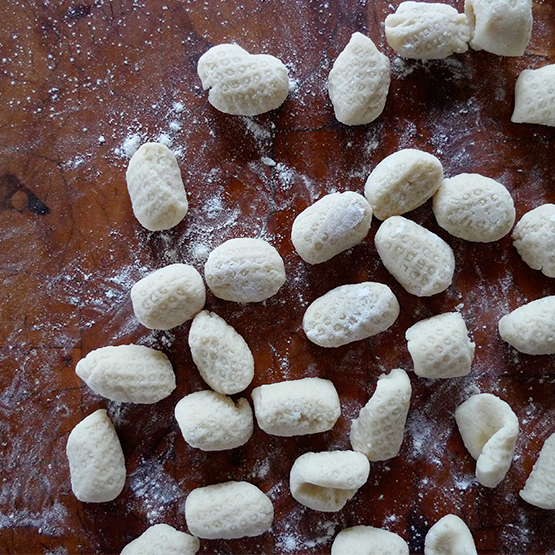 If you have any filling left over, you can form it into little balls, sprinkle them with some additional Parmesan, bread crumbs, and a generous amount of olive oil, and bake them in the oven at 425 degrees F until crispy and browned, about 30 minutes. Sew up the chicken's cavity with cooking twine, or close tightly using skewers. Transfer the chicken to the pot of boiling water, and bring the water back up to a simmer. Cook the chicken for 1 to 2 hours, depending on what amount of time is convenient for you; this dish offers the cook a lot of flexibility, and is delicious regardless of when you take the chicken out during this time. To serve, carve the breast into slices and separate the legs and wings. Plate the chicken with a scoopful of the stuffing alongside. Garnish the meat with a drizzle of your finest extra-virgin olive oil and a sprinkling of crispy salt.